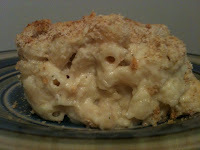 The Editor's Taste Buds: Mac & Cheese with Minimal Cheese? It's Possible! Mac & Cheese with Minimal Cheese? It's Possible! This blog has been sadly ignored for the past few months, and I apologize. Life happened. I've still been cooking and baking -- and taking pictures along the way so I can share the experiences with you. I came across this recipe for "creamy cauliflower mac" from Mark Bittman in my Facebook news feed last weekend. It caught my eye because a friend of mine had just posted a funny Facebook status about adding pureed broccoli to pizza sauce to get her daughter to eat it. When I clicked the link, I was pleasantly surprised to see a fairly short ingredient list that included things that mostly were already in my kitchen. Last night, I pre-prepped the recipe up through the point Bittman recommended. Tonight, I baked it up and had it for dinner with part of a chicken breast. It was fragrant, creamy and quite tasty. But as with any new recipe, I immediately formed a "what I'd do differently next time" list in my head. · Actually use stock rather than broth. I only keep broth in the house and usually substitute it in recipes that call for stock. This was an example of a recipe that really would've benefited from the richer flavor of stock versus broth. · Use a strongly flavored cheese. I used a three-cheese blend (cheddar, Colby, Monterey Jack) that just didn't pack enough punch, I discovered when I tasted the puree. So I added a couple slices of Swiss that I had in the fridge. It helped, but I wish I'd chosen my cheese differently. Next time, I'll use Fontina (a personal favorite), Gruyere, Emmental or maybe even smoked Gouda. By the way, a half-cup of cheese for an entire dish of mac & cheese isn't much, so don't feel bad about adding in a little extra. · Undercook the pasta just like the recipe says. If you don't, it will become too soft when you bake the dish. I'd say I may have boiled mine 1 to 2 minutes too long. I use Barilla PLUS pasta, which takes a little longer to cook under normal circumstances, so I adjusted the stovetop cook time accordingly. It was an error. I should've stuck with Bittman's recommended five minutes. · Add garlic. It felt like something was missing. I'm convinced it was garlic. Next time I'll add a clove or two to the puree. · Use frozen cauliflower florets to save time. Vegetables that are frozen fresh without any kind of sauce/butter added make recipes like this one easier and just as healthy. I used two 12 oz. bags of frozen cauliflower for this recipe. Kroger has its own large line of frozen veggies these days, and they often are on sale for around $1 per bag. It's a great deal, especially when you're shopping for recipe ingredients. I love vegetables, so this was a great alternative to the standard mac and cheese. Between the high veggie content, the low cheese content and the healthy pasta, I didn't even have to feel guilty about having a hearty serving. This recipe is definitely being filed away for future use!